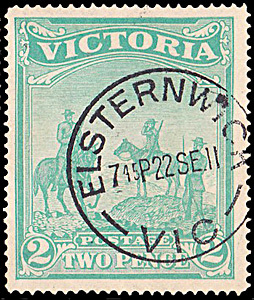 The 1900 Patriotic Fund issue of Victoria - 2d (2/-) emerald stamp. examples of used examples of the 2d (2/-) off cover and a complete list of recorded examples of stamps with a complete date stamp. 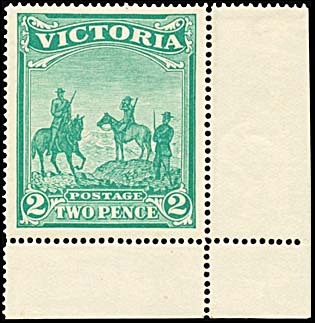 The 2d (2/-) emerald stamp features three members of the Victorian contingent which served in the Boer War campaign - an infantryman "on guard" with a mounted bayonet and two mounted troopers, each with rifles, scanning the Transvaal horizon (the rider on the right possibly using binoculars). 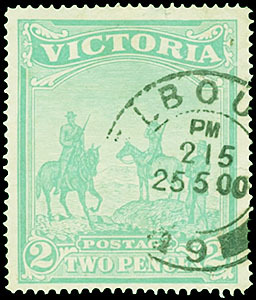 The postal denomination of 2d covered the inter-colonial rate. Both stamps in the Patriotic Fund issue were printed from electrotype printing plates in sheets of 42 arranged in six rows of seven stamps. V over Crown (V4) sideways. Unknown but more than 20,034 stamps (477 sheets) plus some sheets which were sent to the Victorian Agent General in London for sale. a pair with selvedge at the right. It was sold at a Rodney Perry Auction in September 1993. The pair came from the Stone Collection. 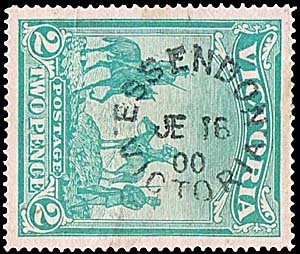 a CTO horizontal pair with Melbourne 28 July 1902 cancellation across the join. It was sold by Status International in July 2002 as Lot 1472. As noted elsewhere, used 2d (2/-) stamps in good condition with a clear date stamp are scarce. There are at least 15 but probably less than 25 examples recorded. Prestige Philately June 2012 Lot 471. (Late cancellation - out of postal validity). Status Auctions January 2013 Lot 1952. Date stamps on 2d (2/-) stamps. The list below records the clear date stamps on the 2d (2/-) 1900 Victorian Charity stamp. CTO cancellations are discussed elsewhere. 25 May 1900 Melbourne. Prestige Philately June 2012 Lot 471. 28 May 1900 Melbourne. Double circle date stamp. Matthew Bennett April 2003 Lot 2831. 30 May 1900 Geelong 2. Duplex - rotated anti-clockwise. Status February 2003 Lot 1587. Spink May 2018, Lot 346 (part). 5 June 1900 Spottiswoode Unframed - with 1d (1/-). Ebay April 2018. 16 June 1900 Illowa Unframed Phoenix Auctions, Jan 2015, Lot 776. 24 June 1900 Mildura. Prestige Philately August 2005 Lot 436. 2 August 1900 Port Melbourne 7?. Duplex. Status February 2012 Lot 1672. 16 September 1900 Rialto. Duplex. Matthew Bennett April 2003 Lot 2832. Status December 2006 Lot 1641. 11 January 1901 Melbourne. Double circle date stamp. Ebay September 2013.
and November 2013 Lot 5546. Status June 2013 Lot 1845.